Summer is a time for fun, sun, and most importantly, finding a song to define the season. The Rebecca Crown Library is showing off some older but classic material. Come take a look through some of our more popular CDs ranging from The Lion King to Carmen. There are also DVDs including The Sound of Music, Standing in the Shadows of Motown, and American Folk Blues Festival. For the history buffs, we also have books covering Hip-Hop, Rock, and Pop Music. Further more, look at the different vinyl cover art and covers on the sheet music to see how art has changed through the years in the display cabinet. Between 2001-2006 Boston College embarked on an Oral History program to document Northern Irish immigrants’ history during the Troubling Times. They called it the Belfast Project and interviewed close to 50 people who were part of the IRA (Irish Republican Army) or another paramilitary group called Ulster Volunteer Force. There are many open crimes in Northern Ireland during the Troubling Times and the United Kingdom has a treaty with the United States where the U.S. is required to give any evidence it may have to open, violent crimes. One of these open violent crimes was the abduction and murder of Jean McConville in 1972. The IRA accepted responsibility for the murder, but no one was ever arrested. After hearing that Boston College might have some information in their Belfast Project, the British Authorities urged the Justice Department to obtain this evidence. Boston College refused, went to court, and lost just last week. The university gave up seven interviews to the Justice Department, who passed it along to British authorities. Last week, the authorities arrested a prominent Irish politician for Jean McConville’s murder. Central to Boston College’s case is the understanding that these interviews were to remain as oral history. It was a preservation interview, not an interrogation. The project leaders have been accused of being biased against the politician’s political party, and hostile to the interviewees. The project leaders have severed all relationships with the college, believing that Boston College should have fought harder for this information to stay private. Wednesday, Boston College announced that it would return these interviews, if the subjects wanted them back. How private is oral history? There are no laws that hold an interview between an academic and an interviewee as private. In this case, the people interviewed expected a level of privacy. The project leaders certainly thought that the college would have done a better job to protect these interviews. As Northern Ireland looks to close a turbulent chapter in their history, academics across the world will have to evaluate how explosive some of these interviews could potentially be. In 1964 the Science Fiction author Isaac Asimov made some predictions about 2014. Asimov is responsible for the popular I, Robot, and the Foundation series; he is, also, known for his Three Laws of Robotics. A robot may not injure its own kind and defend its own kind unless it is interfering with the first or second rule. His predictions range from the invention of 3-D movies and television to being able to dial Antarctica. While he also thought everyone in 2014 will be seeing psychologists, the rest of his predictions are pretty much on target. The BBC collected and presented most of them. It is another example of how Science Fiction can and has molded our future. How much do you think society and technology will be changed 50 years from now? On this day in 1807, former Vice President Aaron Burr was arrested for treason. Yes, he is the same Aaron Burr who killed Alexander Hamilton on 1804. Hamilton frequently expressed his contempt of Burr’s character; in retaliation Burr challenged Hamilton to a duel. While it is still debated if Burr meant to kill Hamilton (please see the Pulitzer prize winning book Founding Brothers for more information), Burr fled Washington D.C. to escape the political fall out. He spent his time in New Orleans and Virgina before contacting U.S. General James Wilkinson. General Wilkinson was a Spanish agent, and the two concocted a plan. Again, these details can be hazy. Their plans range range from an independent republic in the American Southwest to a seizure of Spanish territory for the same purpose. Either way, Burr led a group of well-armed colonists on a march towards New Orleans. U.S. authorities started to investigate, and this is when General Wilkinson turned on his co-conspirator. Have you ever wanted to learn a little bit more about American History? Take a minute to step away from the typical books and articles and immerse yourself into some engaging and educational videos! Let history come to life! American History in Video is an amazing resource provided by the Rebecca Crown Library containing over 5,000 titles only a click or two away. This video database has topics ranging from Pre-Columbian Americas to early 21st century America. Truman’s State of the Union was the first televised. The first opposition response was in 1966, and the Republican Party felt that they needed a response since it was being televised during prime time. The person they chose? Gerald Ford was the first opposition party response, and there have been six more times that the opposition response was given by a future President or Vice President of America ( Ford in 1966 and 1967, Ford and Rep. George Bush of Texas–among others–in 1968, Rep. Al Gore, among others, in 1982, Joe Biden, among others, in 1983 and 1984, and Bill Clinton, among others, in 1985). One person in the Cabinet, one member of the House, and one member of the Senate do not attend a State of the Union. These members are kept separate throughout the entire address. This is to ensure a continuity in policy if there were to be a catastrophic event during a State of the Union. If you are even more curious about the State of the Union Congress put together a FAQ in 2006, and two college professors from the University of California at Santa Barbara compiled the Presidency Project. And there is always our collection in our catalog! References: Schlesinger, R. (2012). State of the Union Trivia and History. U.S. News & World Report. Is there a Salinger Vault? When J.D. Salinger died in 2010 at 91, the rumors started swirling. Giving a new definition to the word “recluse”, Salinger stayed out of the limelight for decades before his death. What did he spend the last years of his life doing? Was he really writing numerous stories upon stories? Books upon books? Did he leave a list of stories to publish without editing, stories to publish with editing, and stories to destroy upon his death? And if he had anything to publish would it be as good as Catcher in the Rye or Franny and Zooey? Or would the stories be ramblings of his eastern philosophies? A new biography says that there will most definitely be more writings by this author as soon as 2015. 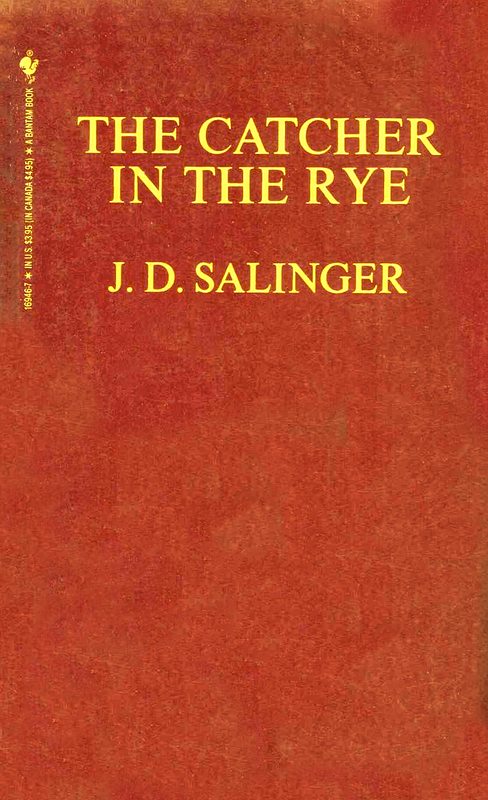 The biography was released to coincide with the movie, also titled, Salinger. The authors spent two years interviewing people who knew Salinger, and the book focuses on these interviews. David Sheilds and Shane Salerno, also, focuses on Salinger’s World War II experiences. But the authors answer the most important question: Will there be more books written by J.D. Salinger? The answer is yes, but the form that these books will take is still in question. You can check out our Rebecca Crown catalog for more information on J.D. Salinger. References: “Salinger and the Mysterious Vault”, American Library Association, December 17, 2013.